Conservators, architects, academics, and armchair archaeologists will soon be able to access detailed digital documentation of some of the world’s most famous cultural sites via the Web. At press time, the nonprofit Kacyra Family Foundation (KFF) was slated to launch its CyArk 3D Heritage Archive in mid-August. 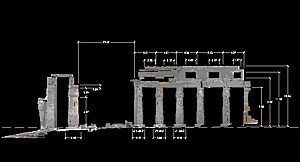 The open-access www.cyark.org will initially include documentation of nine sites as diverse as the South Dakota gold rush town Deadwood; the ancient Khmer capital Angkor, in Cambodia; and Pompeii, in southern Italy. Foundation officials hope the archived material will be used for site management, restoration, and education. The monuments, many of which have been designated World Heritage sites by the United Nations Educational Scientific and Cultural Organization, have been documented with a variety of techniques. 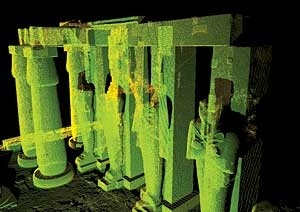 The core technology is 3D laser scanning, which uses a tripod-mounted laser device to scan objects and produces a digital collection, or “cloud,” of points in three dimensions. This data can be reassembled to create other media, including detailed 3D models, dimensioned 2D drawings, and animations. These images of the Ramesseum, in Luxor, Egypt, are representative of the material in the CyArk archive.